A game of intrigue, guile, and warfare in Renaissance Italy. Take command of a mercenary army and carve out your own personal kingdom! 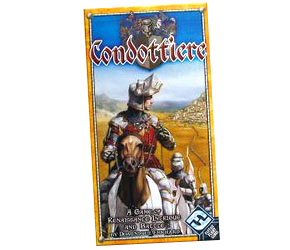 A nice little card game with a small board where players fight to win card battles to conquer regions of Renaissance Italy. Simple and fun, and cards with special abilities keep things interesting.